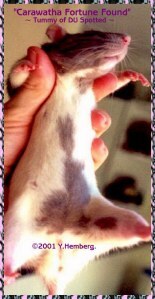 "Rodentranch Enigma" - 1st furred DownUnder Rat. "Rodentranch Rarity" - 1st Manx from the DU lines. the DownUnder pattern mutated from this line. 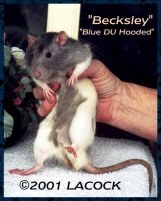 DU Hooded-should have no body spots, with both ventral stripe and dorsal hood straight, even and clean edged. DU Spotted - must have as many spots as possible. Both ventral and dorsal markings to be as broken up and irregular as possible. Headspots, shoulder notch & chest patch desirable. DU Berkshire - feet to be as for berkshire standard and not to join the white of the sides. Sides of belly to be as dappled, roaned and spotted only, with the central ventral area completely coloured. ALL PHOTOS ARE COPYRIGHT & USED WITH HER KIND PERMISSION. A good shot of the sparkling appearance of this new colour.